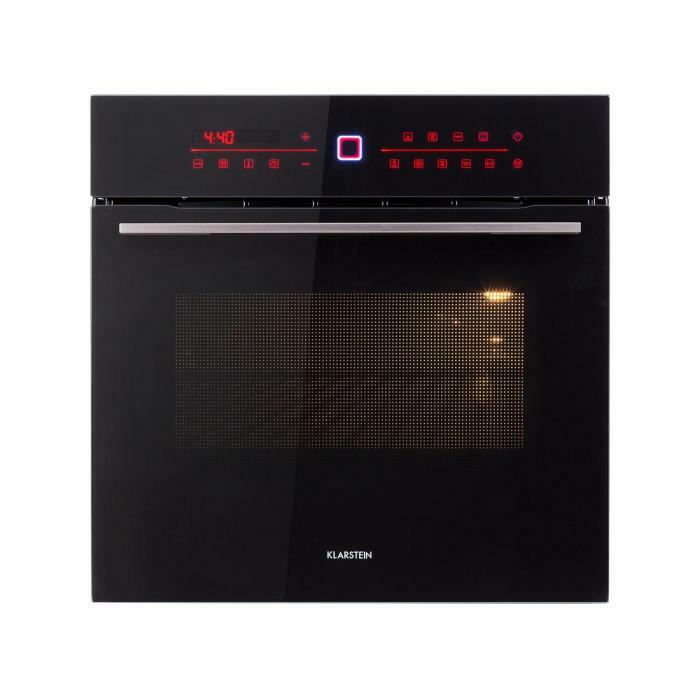 Time for luxury: the Klarstein Luminance Nova electric built-in oven is a powerful device with many functions and is particularly environmentally friendly. The device offers excellent features: with energy efficiency class A, it skillfully and economically prepares cakes, casserole, pizza and more in its large 70-litre capacity space. With the 9 functions tof hawing, bottom heat, top and bottom heat, circulating air, top and bottom heat with circulating air, grilling, double grill, grill with fan and grilling with rotisserie and motor, it meets all requirements for an uncomplicated and efficient cooker. In addition, the Luminance Nova built-in oven has an easy-to-use cooking timer and selectable temperatures between 30 and 250 ° C. The operation is self-explanatory and comfortable on the elegant touch control panel. Ingenious NovaClean self-cleaning: the catalytic coating absorbs grease particularly well and ensures that food residues from 200 ° C evaporate to water and CO2. This makes cleaning a breeze, since the oven for the most part cleans itself. For the baking sheet, grate and rotisserie there are five slots, which make it easy to prepare different dishes. Of course, the built-in oven also offers maximum safety: two optional telescopic rails ensure that nothing tilts even when almost completely pulling out the sheet, and even a child safety device can be easily activated. With its futuristic PureAmbience design with SenseControl control panel and triple-glazed door, the Luminance Nova electric oven from Klarstein sets elegant accents and is a real visual highlight in every kitchen.